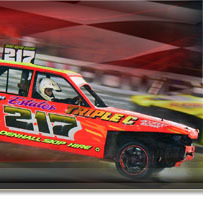 Saloon Stock Car racing is one of the oldest-established formulas on the UK short ovals, but by contrast the Spedeworth 2.0 Stock Cars are a relatively new creation. The formula features Ford Sierra-based machines with two-litre engines and heavy armouring around the exterior, and heavy crash and bash action is always a feature of every meeting. Some may confuse the heavy hits of the formula with Banger racing but these machines are built to last and heavy follow-ins are not allowed. The class races principally on the Spedeworth tracks of the south and east as their name and origin suggests, but they visit the Midlands at the annual Good Friday fixture at Northampton International Raceway.